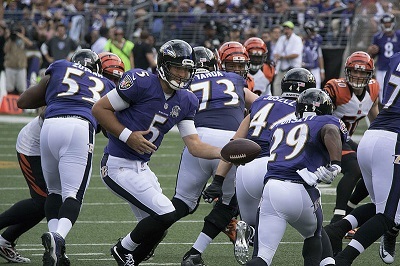 Get notified when Baltimore Ravens tickets are available! The Baltimore Ravens are a popular American professional football team that is based in Baltimore, Maryland. Formed in the year 1996, they have since won 2 Super Bowls. The first win was in 2000 and the second win took place in 2012. The Baltimore Ravens play their home games at the M&T Bank Stadium, adjacent to Oriole Park. The M&T Bank Stadium can fit up to 71,008 fans. Their colors are black, metallic gold and purple and their team name was inspired by Edgar Allen Poe’s The Raven. See them live at M&T Bank Stadium by purchasing Baltimore Ravens tickets using the links above.